Wahama head baseball coach Tom Cullen, second from left, is joined by his coaching staff of Ron Bradley, Phil Hoffman and statistician Gary Clark during the fifth inning of a Region 4, Section 3 baseball contest against Calhoun County at J.C. Cook Field in Mason, W.Va.
MASON, W.Va.— It was definitely worth the wait. 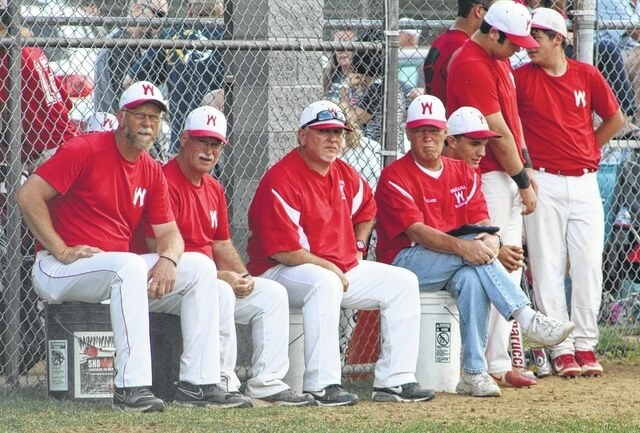 After serving as an assistant for more than two decades, Tom Cullen took over as head coach of the Wahama baseball team in 2005. Eleven seasons into his tenure as the White Falcons’ skipper, Cullen led WHS to its third Class A baseball state championship and its first since 1998. Wahama’s 7-0 victory over Man in the state final capped off the White Falcons’ 25-7 season, in which they recorded 10 shutout victories and outscored opponents 251-62. WHS posted double-digit runs 12 times this year and held opponents to two or fewer runs 23 times. The White Falcons finished the season with a team batting average of .298, a team fielding percentage of .925 and a team earned run average of 1.27. The WHS pitching staff struck out 283 batters, walked 100 and allowed opponents to hit just .174. Wahama’s leading returning hitter had an average of just .198 last season, but no one with at least 60 plate appearances ended the season with lower than a .250 average. Cullen has been a part of three other Class A baseball finals in his coaching career, first assisting in 1988 when the White Falcons were runners-up to Van by a 2-1 count. Tom was also an assistant on both 1996 and 1998 championship teams. In 1996 WHS defeated Van 3-2, while the 1998 White Falcons defeated Moorefield 9-4. Cullen was also an assistant on the White Falcons’ 2012 Class A football championship team. The victory over Man also served as revenge for Wahama, which was eliminated by the Hillbillies in the 2005 and 2009 regional finals. Cullen cited an April 15th 1-0 loss to Charleston Catholic as the turning point in the season. Following that setback Wahama won 10 straight games and outscored opponents 84-13. The White Falcons also received some guidance from former MLB all-star, Parkersburg native Steve Swisher. Since joining the Tri-Valley conference five years ago the White Falcons have won at least a share of three league championships. Wahama is aiming to become the first TVC Hocking team to three-peat in baseball since Eastern did so from 2008 through 2010.